Those of us fascinated by old musical instruments have no better friend than the Belgian CD label Ricercar, which among its many other fine releases produces a series ca1led ‘Collection Instruments’ . Each disc spotlights one of two now obscure instruments, such as the German Shalmei, the dulcian, crumhorns, organetto and so on. Repertory, instrument design and performance practice are all meticulously researched and the findings presented for our delight and edification. 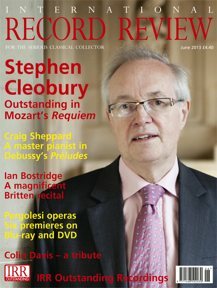 The latest such volume features a young ensemble called Le Miroir de Musique and focuses on the renaissance violin and the earliest repertory in which it appeared. Renaissance violins are quite different even from those high-Baroque models by makers such as Jakob Stainer, with which we have become quite familiar in recent decades. Some musicians who take historical performance practice seriously are no longer content to use a generic Baroque or ‘period’ violin to play everything from Monteverdi to Mozart. Ensembles appearing on several recent recordings of the Monteverdi 1610 Vespers, for example, have featured string instruments that have been specially commissioned and built specifically for that performance. In fact, the renaissance violin has become not uncommon in performances of music from the early Baroque. However, it is rare to hear it used to play pre-Baroque music, and almost unknown to hear it in music from the first half of the sixteenth century. We are accustomed to think of the early violin as primarily an instrument used in dance music — to play Praetorius’s Terpsichore dances, for example, in sonatas and canzonas by composers such as Fontana and to play (dance-like) ritornellos in both sacred and secular works by Monteverdi and his school. Yet, as this recording demonstrates, that was not its core repertory at all when it first appeared. The violin’s reputation as the preferred instrument of dancing masters — which was held against it by French defenders of the rival viol well into the early eighteenth century — is quite at odds with its origins. From the first documented appearance of the ‘ vyolon ‘ at the court of Savoy in 1523 , the new instrument was for some decades used not in popular or ‘light’ genres such as monophonic dances but in the most serious and complex repertory such as madrigals, ricercari, Franco-Flemish motets and so on. It is not unusual these days to hear Early Music groups perform sacred and secular music from the early fifteenth century with a mixture of vocal and instrumental forces, but almost none of them uses a renaissance violin. 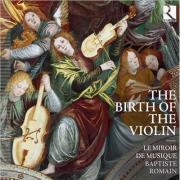 There is a single violin on this disc, expertly played by the ensemble’s director Baptiste Romain. He is partnered in various combinations by a soprano singer, three viole d’arco, harp, recorder, lute and renaissance guitar. The viola d’arco was a fretted, five string instrument which was the link between the late medieval fiddle and the renaissance viola da gamba. Modern luthier Richard Earle built the violin and the viole d’arco for Le Miroir de Musique using early renaissance techniques and all four instruments have a marvellously rich vellum-like texture. Most of the late medieval/early renaissance music chosen to demonstrate the instruments is new to disc and all of it is serious stuff: mostly contrapuntal and deeply rewarding for lovers of renaissance music. All the musicians play with great skill and profound engagement with this repertory. Soprano Sabine Lutzenberger, who is a specialist in medieval and renaissance song, has a lovely voice and she sings with admirable purity and precision. (She is, in fact, just the sort of soprano Jonathan Dunford should have used in his ill-fated Dowland project, ...) The disc has been vividly recorded in Schloβkirche Beuggen. I have but one minor criticism of this outstanding disc, which is that while the Ricercar accompanying essay is very instructive on the early violin and its repertory, there is very little material explaining or illustrating how these unusual instruments (particularly the violin and viola d’arco) differ from later models in construction. Nor are we told what kinds of bows were used, or what playing techniques employed. This small matter aside, I unreservedly recommend this very important release to anyone who enjoys renaissance music and even to those simply curious about the origins of the violin.